He’s the anti-Rahm, but I can’t say how delighted this excerpt from a Times story made me. Edil Baisalov, Ms. Otunbayeva’s chief of staff, dismissed any threat of a civil war in Kyrgyzstan. … Mr. Baisalov [is] a civil society activist who returned from exile in Sweden to join the new government. Edil has spent years fighting for legitimate representative government in Kyrgyzstan as head of the NGO “For Democracy and Civil Society.” For his troubles he has been threatened and attacked. To have him in such a high-ranking position in the interm government gives me great hope that this unfortunate little country will genuinely democratize. 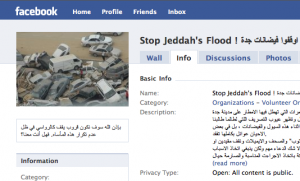 Saudis outraged over the government response to devastating flooding in Jeddah are rioting in the streets. OK, no, they aren’t. But they are protesting on Facebook. Another example of how the opening of digital agora for conversation can have an impact; people are able to share their opinions, organize, and mobilize. Skills people learn and networks they develop will grow and expand over time. This isn’t all negative for an authoritarian government; one of the problems with an ossified and autocratic bureaucracy which has little more than a nodding familiarity with its own subjects is that there are few routes for people to communicate problems. Even indolent, corrupt groups like the Saudi royals want to be able to find out and fix problems; if things like FB provide a route for them to find out about the proverbial potholes then the people will be less likely to, say, overthrow them and string them up from a light pole. The NYT has a great piece on ongoing dissent in Iran. While Ahmadinejad has bloodily quieted the streets, within the government struggles continue. Oooh, snap! A bit of the power of constitutional democracy on display. While authoritarian, Iran’s always had something of a liberal mask; after all, apart from Israel & Turkey they were the most democratic system in the Middle East. But that has been ripped away. On the same principle that you don’t take an ice cream cone away from a toddler, this may have been a significant strategic error. There’s a lot of smart, educated middle-class people in Iran who were already chafing under the religious thuggishness. Not that it is clear they are living under a dictatorship, who knows what the long-term consequences might be.